(Jerusalem, Israel)—[CBN News] Israel prides itself on protecting minorities within the Jewish state. Still, some Christian sites have been attacked by fringe groups over the past few years, prompting government officials to take new steps to protect Israel's Christian community. Dr. Moti Zaken, special advisor to Israel's Ministry of Internal Security on Minority Affairs, organized a series of meetings between government ministries and Christian leaders. "We think it's very important that we will be cooperating to solve problems (and) to improve the relations because we value the Christian groups and their representatives as a very important asset to the Jewish state," Zaken told participants at the fourth meeting in the series. David Pileggi serves as rector at Christ Church, the oldest Protestant church in the Middle East. 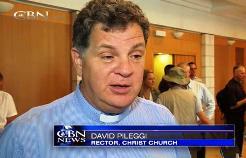 "Our relationship with Israel as the Christian community is good, but it can be better," Pileggi told CBN News. "What we appreciate about this meeting is that we can raise practical concerns and hear reports from different government ministries, the police, the army and find out how they are improving the situation for the Christian minority." The government also wants to improve services to Christian pilgrims from around the world. "It is one of the major, I would say, issues for the Ministry of Tourism to get to know how to approach the Christian world, both outside the country of course—abroad, all over the world—and, of course, inside Israel," Ahuva Zaken with the Tourism Ministry told CBN News. According to the Interior Ministry, that includes visas for Christians. "We want to give a good answer to the Christian population, also to the Christian foundations in Israel, and this is also important to the State of Israel, and I am doing my job, to give every service with all my heart, whatever we can do to make things easier for the Christian population in Israel," Cesare Marjieh, director of Christian Communities for the Interior Ministry, told CBN News. With Christians under severe persecution throughout the Middle East, Israel remains an island of refuge. "It's the only country in the Middle East—in the whole Middle East—that actually has a growing Christian population so that says a lot because (in) all the other countries around this region, the Christians are fleeing as fast as they can because of the persecution, Islamic persecution," Chuck Kopp, senior pastor of Jerusalem's International Congregation, told CBN News. "So we can be happy that Christians are well represented and that they are an integral part of this country." Pileggi believes Christians in Israel may have more freedom than their American counterparts. "There's certainly no comparison between the Christian population here and what's happening all through the Middle East and in many places in Africa and China—and certainly even in the United States. I would say that in many regards, we might have more religious freedom here in Israel than folks would back in the United States," Pileggi said.